As a Registered Dental Assistant, graduate of the U.S. Career Institute, Kasie enjoys helping educate patients on the benefits of diagnosed treatment. Her supportive and understanding spirit is appreciated throughout the dental procedure experience. Fun conversations shared with patients often continue from visit to visit. Kasie is our only employee originally from Lake Havasu. She has worked here ever since becoming a resident of the East Valley. Although, she still spends a lot of time at the lake wake boarding with her family and friends. Being a proud mom of two sons keep her busy at mountain bike competitions and soccer games. Besides developing her creative talents, in her spare time her love for animals and snap chat keep her entertained. Tiffany graduated from Pima Medical Institute. 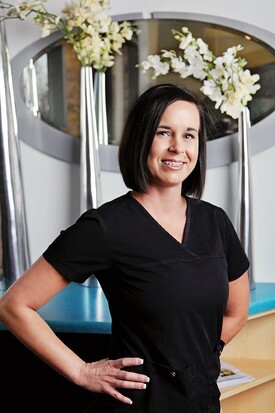 She shares her passion for patient care as a Certified Dental Assistant with new and existing patients alike. Her professionalism combined with her keen sense of humor often helps eliminate the tension some patients feel about being at a dental office. Originally from Minnesota, Tiffany spends most of her time away from work with her extended family that has also moved to Arizona. The adventures she shares about raising her son and her daughter, both toddlers, are usually hilarious. Tiffany looks forward to the days when she will have more time to spend back on the dance floor exhibiting her hip hop dance moves. Kanesha has a lot of experience offering quality patient care. In addition to her dental assisting skills, Kanesha also enjoys working as a Certified Nurses Aid. Her medical training and comfort with patient care is a plus. Kanesha’s genuine personality is evident as soon as she introduces herself. Patients appreciate the professional, yet fun time spent together during their dental visit. While being a mother to a beautiful little daughter, Kanesha also enjoys immersing herself in the traditions of her Navajo culture. Fishing, sewing, and music are some of her hobbies. By far her most impressive hobby is her artistic talents displayed through her colorful bead work. Barbara is always helpful and hard working. She is sympathetic and eager to help each and every patient. Her high energy is displayed by the sound of her quick feet taking steps up and down the hallway as she dedicates herself to getting as many daily tasks done as she can. Originally from Germany, Barbara has enjoyed moving many times, as her late husband served in the U.S.Military. Barbara choose to put down roots in Gilbert over 7 years ago, her home purchase offers stability for her to continue raising her three children. Staying in close contact with her family and friends, here and abroad, helps to keep a fresh connection with her heritage. Barbara shares with us all the traditions, foods, and general information of how life is in Germany.